NOTE: If you haven’t seen this movie, there are spoilers below! What are our perceptions of the police? To say that our social relationship with police officers has been quite strained in the past few years is an understatement. Many would say relationships with the police have been strained for decades. Some would say millennia. Zootopia takes an interesting stand on this issue. Its main character — Judy Hopps — is a female character in a profession that the film showcases as male dominated. She is smart, agile, small, and less muscular, all characteristics opposed to the police officer archetype in the film. Hopps’ first job on the force is also as a “meter maid”, its least desirable role. This immediately puts her at odds with her dreams, but demonstrates an interesting perception that society has of those officers tasked with tending parking meters. The larger strained relationship with the police that is the very public reality of our current society is left untouched by Zootopia. Hopps and the other officers are mostly trusted by the citizens of the city, and often welcoming. There is one moment in the film, however, that touches on the impact the police force have on the public’s perception of a group of people. The storyline brings Hopps into a crime investigation in which she attempts to track down some missing citizens. In the midst of this investigation, she uncovers a group of animals who have seemingly returned to their more primal form. When Hopps addresses the media after her finding, she states that these “predator” animals are experiencing “biological” tendencies causing them to become more “savage” and that the “prey” animals need to be aware of the predators. This immediately creates a dynamic rift in the citizenry, increasing talk about separation of classes of animals, tracking predator animals, and creating laws to monitor them. Hopps’ language raises issues of discrimination, species profiling, privacy intrusion, questions of what it means to be “civilized”, and how the public reacts to deep seeded stereotypes. What was the war on drugs really about? About midway through Zootopia, officer Hopps learns that the reason why predator animals are reverting to their more animal-like state is because they are being poisoned by Night Howlers — a type of flower that is distilled into a drug-like form. These flowers are being cooked-up in secret by assistant mayor Bellweather, a sheep. While this plot line appears on the surface to be rather benign, its undertones are far from it. The notion that drugs being cooked up by the government are distributed to only a certain group of the population is directly linked to questions theorists pose about the crack epidemic of the ‘70s and ‘80s. Furthermore, Bellweather’s thoughts about how to control the population of predators through the introduction of drugs and raising of people’s fears speaks to the deeper sociological message of this plotline. How does society treat physical difference? When the film begins, Hopps is growing up in Bunnyburrow — a small “town” outside of Zootopia. She longs for the life in the big city, its hustle and bustle, its variety of residents, and its inclusivity. As she experiences the city inclusivity becomes all the more apparent, particularly when it comes to physical difference. 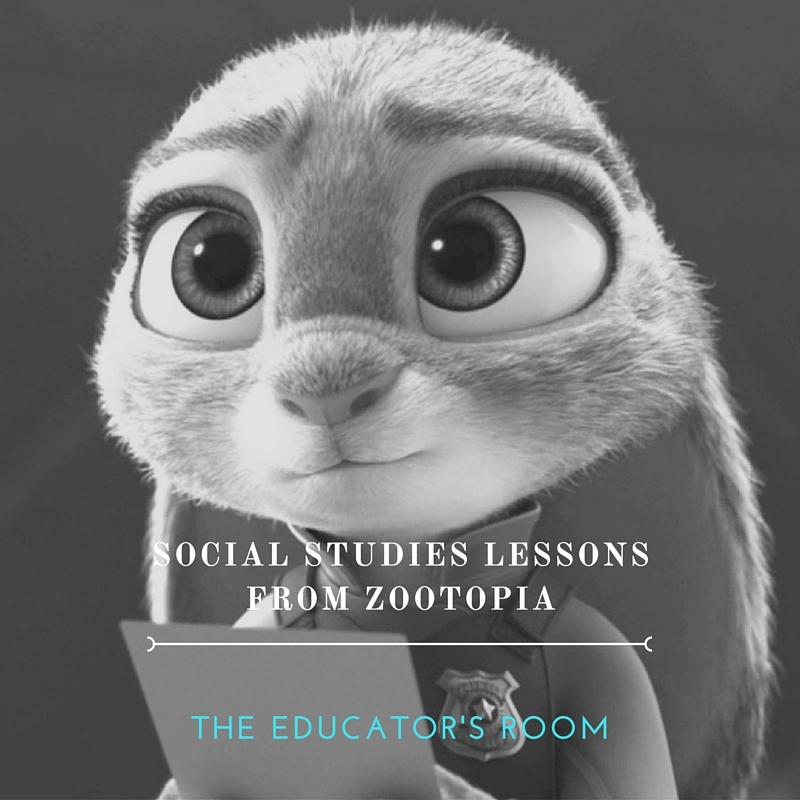 There are means built into Zootopia to meet the needs of a variety of different kinds of residents. Giraffe-size and hamster-size animals all have their own doorways, mice have their own part of town with its smaller scale and forms of transportation, and all public transportation is easily accessible to all species regardless of size. Different parts of town are designed for different species, but species are often found about in the different neighborhoods despite their specific purpose. This part of the film raises sincere questions about how our society treats physical difference. Whereas Zootopia comes across as a city and society that embraces physical difference, our society often relies on discriminatory practices for those with physical differences. Watch this amazing section of Examined Life — a Canadian documentary that is a series of interviews with modern philosophers — that features an interview with Judith Butler and Sunaura Taylor who talk about this often overlooked topic. How do we design cities to (NOT) accommodate residents? The city of Zootopia is divided into seven major districts: Sahara Square, Tundratown, Little Rodentia, Rainforest District, Savanna Central, Meadowlands, and Canal District. Although the districts are designed to meet the needs of their primary residents — Tundratown, for example, has rivers with ice floats for its polar residents — a variety of residents often work, visit, and hang out in districts that are not specifically designed for them. Public transportation is also designed to seamlessly transport residents from district to district, creating a strong sense of district integration and community. Urban design is not often a topic that many secondary or presecondary school teachers address. It is a complicated topic, integrating geography, various aspects of sociology, political science, civics, and futurism. Zootopia raises significant questions about regional planning, city design, and ideas of how a city is built to accommodate rather than exclude. Many of our current cities are designed with some sense of sameness: Neighborhoods look similar because there is some thinking that says that people want to feel similar. But in Zootopia, this is not necessarily the case. The city is built to meet the needs and wants of its vastly different residents. It embraces difference and accommodates accordingly with easily accessible linkages between communities, encouragement of integration. Jane Jacobs and Lewis Mumford would be intrigued. Is the singular hero a myth? The final theme of Zootopia that I want to bring up is about heroes. America loves its heroes. Animated movies love their heroes (and more importantly their underdogs). In fact, it is ironic that Zootopia is competing against a hero versus hero film that is bad if only for the reason that the notion that two heroes cannot exist in the same world is ludicrous. Zootopia takes a bit of a different route in its approach to heroes. It works to dispel the idea that a singular hero can truly shape change the world. Conversely, Hopps shapes the world in a very negative way when she does not engage the help of the rest of her police team, resulting in the pitting of predators and prey against one another. As my students will tell you, I have long talked about the myth of the great singular hero. Joshua Wolf Shenk writes about this myth more here in his piece in The Atlantic. The lore of Social Studies courses often focus on great men or great women (mostly great men) that shape our society. We have whole sections of bookstores devoted to biography, autobiography, and memoir. But the truth lies more squarely in what Hopps demonstrates in Zootopia: Great things happen when a community is involved. This lesson is a timeless consideration Social Studies teachers must make in balancing their approach to curriculum and integration of both intellectual as well as social history. Surely, Zootopia will not be the splash that other recently released movies have been. It may not even approach the popularity of the much anticipated Finding Dory (June 2016). But, its lessons are deep, timely, and profound. Share your reviews and stories of Zootopia below!